Ambient Thermal Management is proud to be the innovator of the world's first Stepped Core Intercooler. 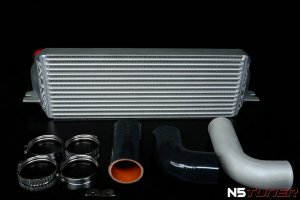 The Ambient Thermal Management Stepped Core Intercooler design has a bigger frontal ambient face combined with thicker-than-stock core that seals to the radiator fan/shroud. The cast end tanks have factory mounting points and factory charge pipe angles. Unlike stepped-core copies that have surfaced, the Ambient Thermal Management SCI features cast end tanks for reduced turbulence and bull-nosed bars on the ambient face as well as the hot side of the intercooler. This increases air flow across the face of the intercooler as well as reducing pressure drop through the core. The core of the Ambient Thermal Management SCI has increased fin density and will flow 400 horsepower with only a 0.5PSI pressure drop, while greatly reducing heat soak. Installation is straightforward and does not require removal of the front bumper. In rare circumstances, very minor trimming of the plastic shroud may be necessary depending on which model you have, but this is rare. Two sets of hands are ususally all that is needed for a trim-free installation. In order to determine your build date, refer to the black sticker on the lower, driver's side door jamb. *There have been changes to the intake charge pipe on models built after 04/09. You may need a different chargepipe to install the Ambient Thermal Management SCI.